Post-punk funk politicos Gang of Four play entertainment in full plus a stack of other hits! One of the most influential and groundbreaking bands to rise from the British punk scene in the late ’70s, Gang of Four finally return this March! Celebrating the 40th Anniversary of their debut release, Entertainment! (Damaged Goods, Anthrax, Naturals Not In It, At Home He’s a Tourist) they will play the album in full + other Hits (I Love a Man in Uniform, What We All Want, Paralysed, To Hell With Poverty) and more. 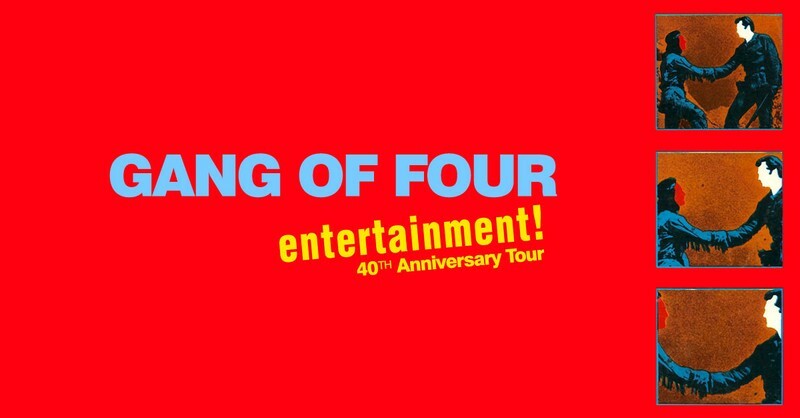 Join Gang of Four as they Celebrate the album that kick started it all and changed the musical landscape, Entertainment!